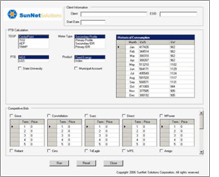 An electricity procurement specialists firm approached SunNet Solutions for a software solution to a business problem. The client assists customers reduce monthly utility cost by taking the customer's historic utility usages, getting bids from utility companies, and then presenting the customer with a report of projected savings. It took about thirty minutes for an experienced specialist to finish the process manually and the process was error-prone. In addition, the cost for training new employees was high. SunNet Solutions worked closely with the client to develop an automated application for the firm’s business process. A backend database was designed and implemented that would store customer’s historic usages as well as various taxes and miscellaneous fees required in order to calculate utility costs. A front-end user interface was developed to allow specialists to enter customer information and bids from utility companies. Within a minute, an easy-to-read report is generated that shows multi-year projected savings. Microsoft .NET and Access database were used in developing the application.